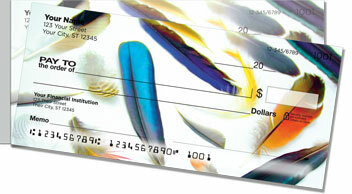 Artistic illustrations of colorful feathers create a check design that displays your taste for natural style. Feathers are the miracles of nature that make flight possible. We marvel at birds as they soar through the sky. Perhaps that's why we've been incorporating feathers in our fashion for thousands of years. From the headdresses of Native American tribes to today's trendy feather earrings, they are organically beautifully and delightfully delicate. 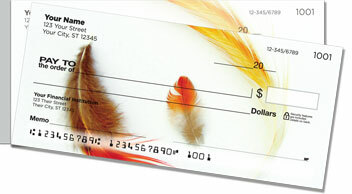 Feather Collection Side Tear Checks from CheckAdvantage portray original artwork that you can only order online right here. 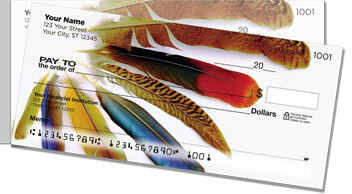 Plus, the side-tear design makes it easy to pull checks from the pad without ripping. 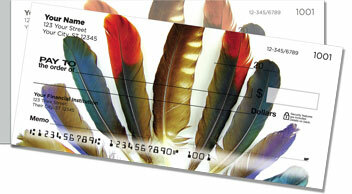 Make Feather Collection Side Tear Checks yours today! Add matching address labels to your order and give your mail a unique look as well!